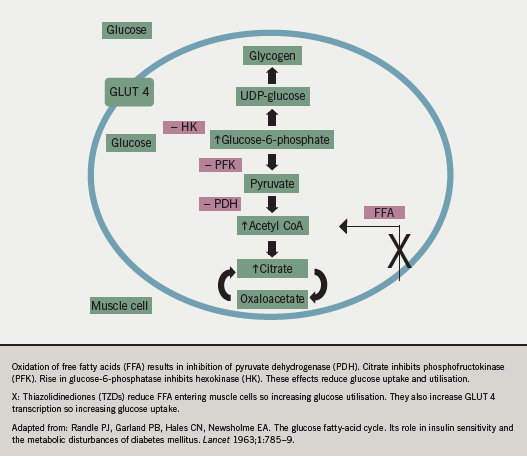 Thiazolidinediones (glitazones) are a relatively new addition to the type 2 diabetes drug armoury, but they have caused considerable controversy since they were introduced into the routine management of patients with type 2 diabetes. Until recently there were two thiazolidinediones licensed for use in the treatment of type 2 diabetes: rosiglitazone and pioglitazone, but the European Medicines Agency (EMEA) on the 23rd September 2010 removed rosiglitazone’s marketing authorisation across Europe because of concerns about cardiovascular safety. There is no evidence to show a similar cardiovascular safety concern for pioglitazone, apart from increased fluid retention and reported heart failure. Pioglitazone may still have a therapeutic role in the management of selected patients. During the past 10 to 15 years, numerous drugs have been introduced for the treatment of patients with type 2 diabetes to prevent the complications of poor glycaemic control. Two such oral drugs, rosiglitazone and pioglitazone, belong to the class of drugs called thiazolidinediones (TZDs), also known as glitazones. Both were licensed for use as monotherapy or in combination with other hypoglycaemic drugs. Through their actions on peroxisome proliferator-activated receptor (PPARγ), they improve hyperglycaemia and alter dyslipidaemia. It was hoped this would translate into cardiovascular benefits for patients taking them. Recent evidence has shown that both TZDs have different cardiovascular safety profiles, with rosiglitazone being linked to harm and pioglitazone, at worst, being neutral, although both have been shown to cause weight gain and oedema and are associated with an increased risk of heart failure. The concerns about rosiglitazone’s cardiovascular safety led initially to the Medicines and Healthcare products Regulatory Agency (MHRA) issuing guidance limiting its use, but subsequently its marketing authorisation has been withdrawn, and, therefore, it is no longer available in the UK. Pioglitazone is still available for use in selected patients, but such patients should have their heart failure risk assessed before they are prescribed it. A further meta-analysis of 84 published and 10 unpublished trials of pioglitazone compared with placebo or other therapy, and excluding the PROactive trial, reported a reduction of all-cause mortality with pioglitazone (odds ratio [OR] 0.30, 95% CI 0.14–0.63, p<0.05),9 but no significant effect on non-fatal coronary events. A further meta-analysis with 16,390 patients found a reduction in the primary composite end point (death, MI or stroke) with pioglitazone compared with control (HR 0.82, 95% CI 0.72–0.94, p=0.05).10 While oedema, weight gain and heart failure were increased in patients in these trials, no increase in mortality from heart failure was observed. In summary, these studies and meta-analyses showed no long-term cardiovascular concerns regarding the use of pioglitazone with there being a suggestion of benefit in certain patient subgroups. In the last few years several meta-analyses have raised concerns about the cardiovascular safety of rosiglitazone therapy in patients with type 2 diabetes mellitus.11-13 A Cochrane systematic review3 of some of these data reported insufficient evidence to draw conclusions on the effect of rosiglitazone on outcomes such as cardiovascular mortality or morbidity. The Rosiglitazone Evaluated for Cardiac Outcomes and Regulation of Glycaemia in Diabetes (RECORD) trial14 was a prospective open-label non-inferiority trial where 4,447 people with type 2 diabetes were randomised to rosiglitazone-based therapy versus combination therapy with metformin and sulphonylurea. Cardiovascular hospitalisation or death was experienced by 321 patients in the rosiglitazone group versus 323 in the control group (HR 0.99, 95% CI 0.85–1.16). The study was powered to exclude a 20% or greater excess risk of cardiovascular disease with rosiglitazone. The overall event rate in the study was lower than anticipated in the study protocol power calculation, meaning the trial had less statistical power than planned. Nonetheless, the authors reported that the CI for the primary end point HR excluded the predefined 20% excess risk; therefore, it is not known whether rosiglitazone could be associated with an excess risk smaller than 20%. In this study the HR for MI was elevated, but non-significantly, at 1.14 (95% CI 0.80–1.63), while the HR for stroke was 0.72 (95% CI 0.49–1.06). Subgroup analyses of the primary end point suggested a possible non-statistically significant increase in cardiovascular events with rosiglitazone in patients with previous ischaemic heart disease (HR 1.26, 95% CI 0.95–1.68, p=0.055). Rosiglitazone and insulin should only be used together in exceptional cases and under close supervision. This guidance has been superceded with the EMEA suspending the marketing authorisation across Europe. The EMEA initiated a further review of rosiglitazone following the availability of data from new studies.16,17 The accumulated data concluded that rosiglitazone was associated with an increased cardiovascular risk compared with both placebo and with pioglitazone. In view of the restrictions already in place on the use of rosiglitazone, it was felt that there were no additional measures that could mitigate the cardiovascular risk. Differences in cardiovascular outcomes between pioglitazone and rosiglitazone: are lipids the explanation? The cardiovascular safety data for pioglitazone suggest a protective function in some cardiovascular subgroups. The data for rosiglitazone are suggestive of harm. The reason for the difference in outcomes may be due to the different effects both TZDs have on lipids. Goldberg et al.18 conducted a randomised, prospective, multi-centre, double-blind study comparing the effects of pioglitazone and rosiglitazone in patients with type 2 diabetes and dyslipidaemia. A total of 802 patients were randomised to 24 weeks’ treatment with either TZD: 360 were randomised to the pioglitazone group and 366 to the rosiglitazone group. No other glucose or lipid-lowering therapies were allowed, including statins. The effect on HbA1c was similar at 24 weeks in both groups. The primary end point was effect on fasting triglyceride (TG) levels. By week four there was a significant reduction in TG values in the pioglitazone group, but a significant increase in TG in the rosiglitazone group. The values in both groups decreased over the remainder of the study but remained significantly lower with pioglitazone at each visit. At 24 weeks the mean change in TG level in the pioglitazone group was –51.9 ± 7.8 mg/dL (–12% change, p<0.001), while it was +13.1 ± 7.8 mg/dL (+14.9% change) in the rosiglitazone group. High-density lipoprotein (HDL)-cholesterol increased in both groups, but pioglitazone values (mean change ± standard error of mean [SEM]: +5.2 ± 0.5 mg/dL, +14%, p<0.001) were significantly higher than those seen with rosiglitazone (mean change ± SEM: +2.4 ± 0.5 mg/dL, +7.8%). Low-density lipoprotein (LDL)-cholesterol increased gradually with both treatments over 24 weeks. LDL particle size increased in both groups, considered a lower cardiovascular risk feature than smaller particles, but particle size was increased significantly more with pioglitazone (p<0.005). These differences could explain the different cardiovascular profiles of the two TZDs. Pioglitazone is the only remaining TZD licensed for use in the treatment of type 2 diabetes in the UK, following the marketing authorisation for rosiglitazone being withdrawn across Europe. It can offer effective and durable glycaemic control with fewer gastrointestinal side effects than metformin, and it is less likely to cause hypoglycaemia than sulphonylureas. It may have a use in selected patients, but care should be taken in assessing suitable patients as it is associated with weight gain and oedema and an increased risk of heart failure. MF has received speaker’s honoraria and served on advisory panels for GlaxoSmithKline and Takeda. GM and DM: none declared. 1. Gonzalea MA, Selwyn AP. Endothelial function, inflammation, and prognosis in cardiovascular disease. Am J Med 2003;115:99–106. 3. Richter B, Bandeira-Echtler E, Bergerhoff K, Clar C, Ebrahim SH. Rosiglitazone for type 2 diabetes mellitus. Cochrane Database Syst Rev 2007;(3):CD006063. 4. Richter B, Bandeira-Echtler E, Bergerhoff K, Clar C, Ebrahim SH. Pioglitazone for type 2 diabetes mellitus. Cochrane Database Syst Rev 2006;(4):CD006060. 5. Kahn SE, Haffner SM, Heise MA et al. Glycaemic durability of rosiglitazone, metformin, or glyburide monotherapy. N Engl J Med 2006;355:2427–43. 6. Dormandy JA, Charbonnel B, Eckland DJ et al. Secondary prevention of macrovascular events in patients with type 2 diabetes in the PROactive Study (PROspective pioglitAzone Clinical Trial In macroVascular Events): a randomized controlled trial. Lancet 2005;366:1279–89. 7. Erdmann E, Dormandy JA, Charbonnel B, Massi-Benedetti M, Moules IK, Skene AM. The effect of pioglitazone on recurrent myocardial infarction in 2,445 patients with type 2 diabetes and previous myocardial infarction: results from the PROactive (PROactive 05) study. J Am Coll Cardiol 2007;49:1772–80. 8. Wilcox R, Bousser MG, Betteridge DJ et al. Effects of pioglitazone in patients with type 2 diabetes with or without previous stroke: results from PROactive (PROspective pioglitAzone Clinical Trial In macroVascular Events 04). Stroke 2007;38:865–73. 9. Mannucci E, Monami M, Lamanna C, Gensini GF, Marchionni N. Pioglitazone and cardiovascular risk. A comprehensive meta-analysis of randomized clinical trials. Diabetes Obes Metab 2008;10:1221–38. 10. Lincoff AM, Wolski K, Nicholls SJ, Nissen SE. Pioglitazone and risk of cardiovascular events in patients with type 2 diabetes mellitus: a meta-analysis of randomized trials. JAMA 2007;298:1180–8. 11. Nissen SE, Wolski K. Effect of rosiglitazone on the risk of myocardial infarction and death from cardiovascular causes. N Engl J Med 2007;356:2457–71. 12. Diamond GA, Bax L, Kaul S. Uncertain effects of rosiglitazone on the risk for myocardial infarction and cardiovascular death. Ann Intern Med 2007;1479:578–81. 13. Singh S, Loke YK, Furberg CD. Long-term risk of cardiovascular events with rosiglitazone: a meta-analysis. JAMA 2007;298:1189–95. 14. Home PD, Pocock SJ, Beck-Nielsen H et al. Rosiglitazone evaluated for cardiovascular outcomes in oral agent combination therapy for type 2 diabetes (RECORD): a multicentre, randomized, open-label trial. Lancet 2009;373:2125–35. 15. Medicines and Healthcare products Regulatory Agency. Rosiglitazone: current advice on cardiovascular risk. Drug Safety Update 2010;4(1):S2. 16. Nissen SE, Wolski K. Rosiglitazone revisited. An updated meta-analysis of risk for myocardial infarction and cardiovascular mortality. Arch Intern Med 2010;170:1191–201. 17. Graham DJ, Ouellet-Hellstrom R, MaCurday TE et al. Risk of acute myocardial infarction, stroke, heart failure, and death in elderly medicare patients treated with rosiglitazone or pioglitazone. JAMA 2010;304:411–18. 18. Goldberg RB, Kendall DM, Deeg MA et al. ; GLAI Study Investigators. A comparison of lipid and glycaemic effects of pioglitazone and rosiglitazone in patients with type 2 diabetes and dyslipidaemia. Diabetes Care 2005;28:1547–54. 19. Niemeyer NV, Janney LM. Thiazolidinedione-induced edema. Pharmacotherapy 2002;22:924–9. 20. Lago RM, Singh PP, Nesto RW. Congestive heart failure and cardiovascular death in patients with prediabetes and type 2 diabetes given thiazolidinediones: a meta-analysis of randomized clinical trials. Lancet 2007;370:1129–36. 21. Bolen S, Feldman L, Vassy J et al. Systematic review: comparative effectiveness and safety of oral medications for type 2 diabetes mellitus. Ann Intern Med 2007;147:386–99. 22. Nesto RW, Bell D, Bonow RO et al. Thiazolidinedione use, fluid retention, and congestive heart failure: AHA/ADA consensus statement. Circulation 2003;108:2941–8.